I hope for those of you that celebrated Christmas, it was a wonderful day shared with family and friends, and filled with lots of love and laughter. The holidays have always been so special to me. It’s the time to put everything else aside and spend quality time with family and those most dear to us. Nothing is greater than that, in my book! I do tend to feel a bit melancholy this time of year, thinking about my dad who is no longer with us and my grandmother, both of whom I treasured and played a large role in my life growing up. But, life goes on, and although those not with us with always remain in our hearts and minds, we should be joyful of the times we had, and enjoy the days ahead with those here. 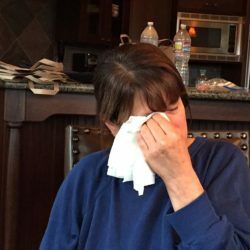 We were home for the holidays but I was so sick with food poisoning from a local restaurant. I think I’ve just about resigned myself to the fact I will never eat salad out again. Slowly recovering, I’m hopeful I’ll be back to normal by next week. I never knew I could be so sick. I feel like I’m finally on the mend! Fortunately, my daughter came to the rescue and prepared a wonderful dinner for everyone, even though I couldn’t eat much. I was so proud of her. I’ll share her recipe next week. New Years Eve is just 4 days away. Maybe you’re going out on the town, but if not, here’s a recipe that’s so simple but spectacular for a celebration, and delicious! What I love best is you don’t have to slave over it all day. In fact, you can prep it the day before, place in the refrigerator and take out an hour before placing in the oven, to get to room temperature. 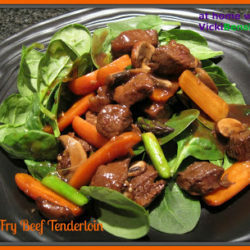 It goes great with any kind of potato, veggie and salad, and is loved by all. What more could you ask for? If you’ve never had Prime Rib you’re in for a treat. This recipe will make a luscious crust with a tender and moist interior. It’s so good! Just remember – read the instructions at least 2 times so you’re sure not to miss anything. I hope you enjoy it!…….. 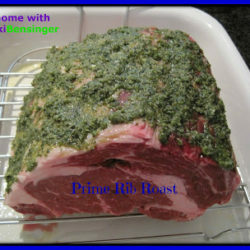 This recipe is for any size Prime Rib Roast (figure 1/2 pound per person or more if you want leftovers). Just do your math and you’ll have a perfect roast every time. 1. With a food processor running, drop garlic into processor, blend until finely chopped. Add sage, thyme, oil, salt and pepper, process until paste forms. 2. Pat meat dry with paper towels. 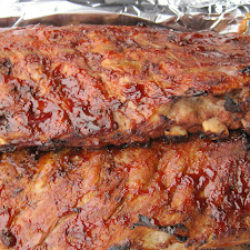 Rub meat all over with herb paste. Cover and chill at least 3 hours. (Can be made 1 day ahead. Keep refrigerated). 3. Approximately 1 hour prior to placing Prime Rib into the oven take beef out of the refrigerator and allow to get to room temperature - very important. 4. Preheat oven to 500F degrees. 5. Roasting time? To calculate the amount of time required for a perfectly Roasted Prime Rib, multiply the total weight of the roast by 5 minutes. 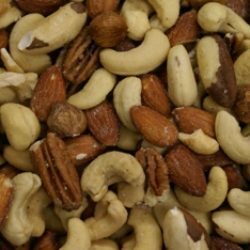 Be accurate - the amount will be listed on your package. Example:Roast weighs 5.42 pounds. Multiply 5.42 (pounds) by 5 (minutes) which equals = 27.10. That’s a perfectly done prime rib roast! Thanks Angie, and it’s so easy! When you pick up your Prime Rib have the butcher label it in US pounds then you’ll have no issues. Although the math souls work the same I would assume. So sorry you got sick! Bummer that it happened over the holidays. Anyway, good look roast there. I’ve heard of this method of cooking prime rib, but have never done it. Come to think of it it’s been years – decades! – since I last cooked prime rib. Definitely something I want to try – thanks. Oh I hate that you were sick during the Christmas celebration. I hope you are feeling much better. The prime rib looks great. Hope you get to enjoy the New Year holiday. Thanks for stopping by my blog 🙂 Happy New Year! Ugh, I’m so sorry about the food poisoning! Something must have been unwashed in that restaurant kitchen, or the sous-chef ill himself – one does not expect salad to do the trick! I managed once in Tahiti from poisson cru left in the sun, and once from green spring eels in Brussels: both times it took a week to feel fully human again. Regarding that beautiful prime rib: have never cooked it by this method, but love the crust and want to try! And, no, dearheart, we have been metric so long, no butcher of ours would know a thing about pounds 🙂 ! Easy enough if you use a calculator at home!! We love prime rib and this rendition sounds wonderful with the fresh herbs. I’m so sorry to read about your food poisoning, Vicki! So scary and so sad that you will never feel comfortable eating salad at a restaurant again. Did you contact the restaurant to let them know? You should at least get a free meal! Thank goodness your daughter was there to help out. What a gorgeous prime rib roast! I won’t be cooking at home but we’ll be celebrating New Year’s Eve at a friend’s home so I’m sure I’ll be bringing something to share. Wishing you a happy (and healthy!) New Year! What a wonderful piece of meat! 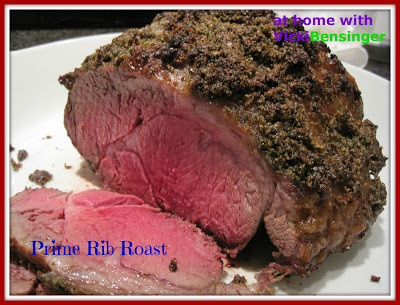 and perfectly cooked – there’s nothing so special as a prime rib roast! Sorry to hear about your food poisoning on Christmas day but glad that you are feeling better now. I have never had ribs and no idea how it is cooked coz we do not eat beef but the pinkish meat looks perfectly cooked and you have explained to its minute details. Have a healthy and happy new year to you and your family! Hi Vicki, Happy New year to you and wish you all the best. So sad that you spent Christmas not feeling well but I bet it made your daughter feel good to be take care of you a bit. 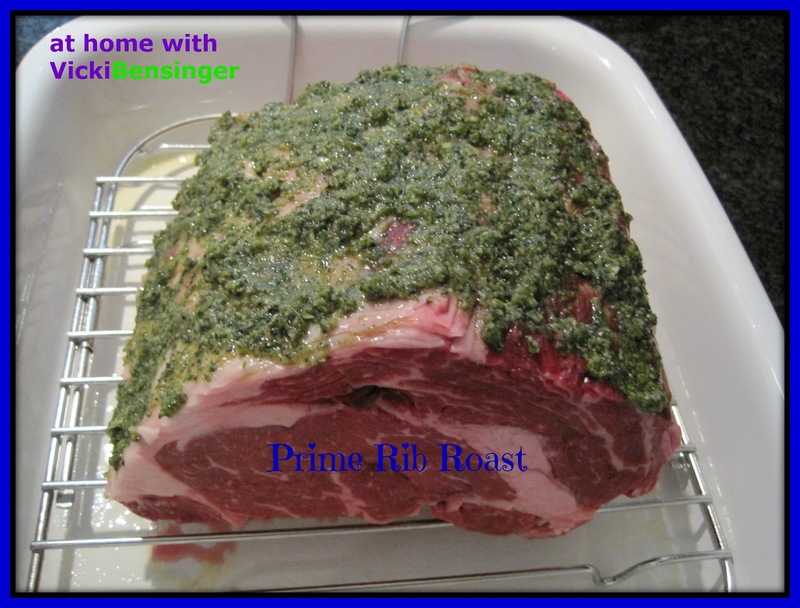 Your prime rib looks fantastic, this is very similar to how my mom used to prepare it. It was always fantastic!